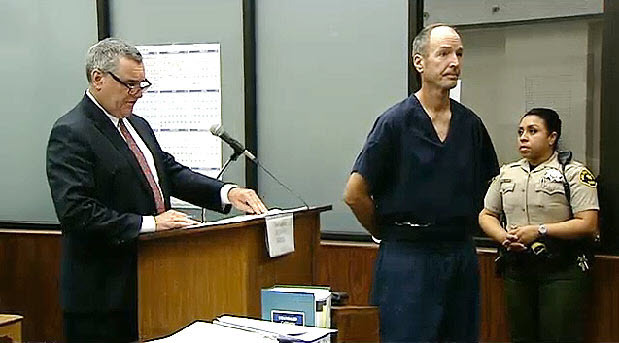 A house painter accused of ambushing and repeatedly shooting CBS News 8 sports director Kyle Kraska in front of his Scripps Ranch home pleaded not guilty Tuesday to premeditated attempted murder and other charges. Mike Montana, 54, was ordered held on $750,000 bail. Deputy District Attorney Rebecca Zipp alleged Montana fired into Kraska’s car just after 3 p.m. last Tuesday as the 48-year-old sportscaster was backing his Mercedes-Benz out of his driveway in the 12000 block of Avonette Court. Zipp alleged that Montana — who did painting work on the victim’s house and was involved in a financial dispute over the job — shot Kraska six times from several feet away, including twice in the upper body, with the intent to kill. “The evidence indicates that this was a planned attack,” the prosecutor said outside court. The gunfire left several windows blown out of Kraska’s silver Mercedes. The victim was found lying face-down on the pavement outside his car and was rushed to Scripps Memorial Hospital La Jolla. Witnesses reported seeing an older-model white minivan with the words “Superior Painting” on the sides speeding off after hearing the gunfire. Montana was tracked to his El Cajon home, where he surrendered to SWAT officers about seven hours after the shooting. Deputy Public Defender Kevin Milmoe told Judge David Szumowski that Montana had lived in El Cajon for 12 years. In addition to premeditated attempted murder with allegations that he caused great bodily injury and personally used a firearm, Montana is charged separately with making a verbal criminal threat to a woman last November, Zipp said. The defendant faces nearly 38 years to life in prison if convicted, according to the prosecutor. The judge set a Feb. 24 status conference and March 2 preliminary hearing date.